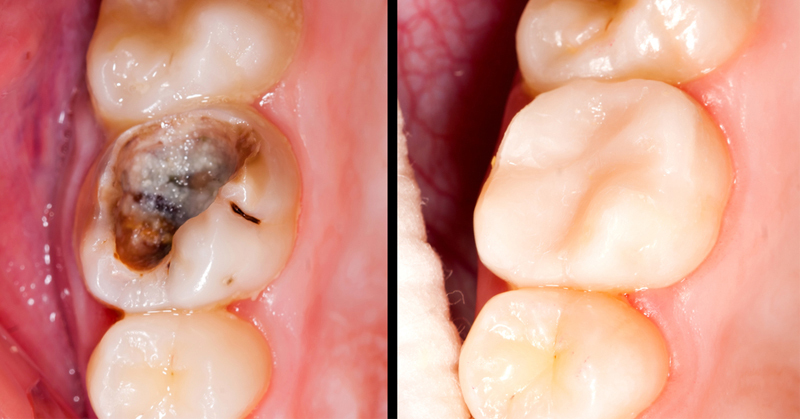 Reverse Cavities and Heal Tooth Decay With These 5 Steps! The enamel of the teeth, as well as the underlying layer, dentin, are destroyed by the tooth decay that results from certain types of acid produced by bacteria. Yet, tooth decay and cavities can be naturally reversed, as opposed to the popular belief. The British Medical Journal published a study which showed that a diet is a powerful natural way to reverse these dental issues. The cavities of participants that ate a standard diet enriched with oatmeal, which is high in phytic acid, increased and improved in people who are a normal diet and supplemented with vitamin D. Yet, the cavities of participants that ate a grain-free diet and nutrient-rich foods, and also took Vitamin D, were healed. Moreover, researchers found that the 4 main factors that contribute to tooth decay include the excessive consumption of processed sugar, phytic acid-high foods, and the lack of minerals and fat-soluble vitamins (A, D, E and K) in the diet. Sugar feeds oral bacteria and inhibits the healthy flow of dental fluids. It is excessively acidic and thus decalcifies and demineralizes the teeth. Therefore, make sure you avoid it if you want to have cavity-free teeth. This is an ancient technique for detoxifying the oral cavity and treating numerous health issues, from toothaches and gingivitis to headaches. You should swish a tablespoon of coconut oil in the mouth for 20 minutes, and then spit it out. “Phytic acid (aka phytate) is often called an “anti-nutrient”.That’s because it snatches up nutrients in the digestive system and prevents them from being digested. Inorganic or GMO seeds, nuts, grains, and beans contain phytic acid, which acts a mineral blocker and enzyme inhibitor that can lead to numerous health issues, like osteoporosis and mineral deficiencies, by inhibiting their absorption and leaching them out of your body, bones, and teeth. While the process of elimination of the cavities is neither easy nor quick, you will witness amazing improvements by making these steps your routine, and you will drastically boost the longevity and health of your teeth.